9:23:00 AM Currently, the easiest way to find a Greater Sludge Panther is to go to the POI, Lost City of Durbin. 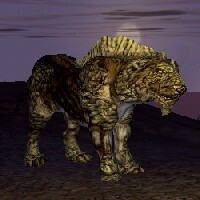 Under the new Beast Master system, DNA can be harvested but the incubated result will drop down to a Sand Panther. Unknown if this is a bug. 7:33:00 PM Changed the GSP to their apparent new level, as mine changed in dpad. Level 49. These beasts are also red now, and they have a wide agro range. They also still attack in packs. 5:43:00 PM I am MCH so I can call 3 =). I call the 3 of them the triplets since I got them all from the same spawn so. Jaws, Paws, and Claws make an excelent combo and I can't wait for Publish 21 so I can give them all their own speciality. 9:51:00 PM I just tamed 3 today, to replace my trio of faambaas. After searching for a GPS and failing miserably again, I decided that these were the next best thing. I only wanted 3 babies but found over 6. U can find lots just outside of dearic. 1:10:00 AM Personally, I prefer GSP's over grand wrix in most situations, because of the GSP's higher HAM. Most of the time, I use pets to tank against creatures, and GSP's and GWs have the same kinetic resistances. Besides, GSPs are bigger! On Talus, there is a long canyon in the southeastern portion of the map. I've seen lots of GSP lairs along the banks of it. 12:15:00 PM Got a couple out of a lair at -756, -1950 on Bria server last night. I had been looking for a lair for 3 days. Funny thing was, I tamed the only baby there, drove around 1000m away, came back, tamed the other only baby there, left again, came back a few minutes later, and the lair had dissapeared. Guess the mommas got tired of loosing their babies and moved. Good way to end the day though. 4:55:00 AM Found a lair near -1243,-3240. Had to kill one adult, then before I tapped the lair, a baby popped out. Got it on the first try! 8:12:00 PM Tamed one today! Posted the sighting. There are a lot of GSPs in that area. 3:34:00 PM Picked one up on a random drive by. Baby and about 6 adults were already out. Managed to sneak in and grab the baby without aggro'ing any of them. 12:45:00 AM I found and tamed my first baby GSP last night, after a long, hard search along a river that runs in a northwesterly direction from Dearic. Interestingly, I came across a pair of adults at the same time a Master CH was approaching them from the opposite side! She courteously allowed me to tame my baby, then gave me the tip that led directly to my capture of a baby grand wrix later that same evening! So I was overjoyed when she later sent me a message letting me know she'd found and tamed another baby further into the swamp. Ma'am, I know you'll see this sooner or later, so I won't embarrass you by calling you by name, but you are DA BEST! 2:08:00 PM Found my first two, yesterday East and Northeast of Dearic on Scylla. 9:55:00 AM I have always kept one of these in my datapad. Superb pet, I can sell em for 25k. Had four once, sold three of em of 75k. Also easy to find around erran sif poi and canyon city on Bria. 10:08:00 PM Today was a great day for me on the lowca server. I found three baby GSP and tamed them all!!! 8:40:00 PM That's something else...I thought Talus was the uber cat planet: Why do great plains stalkers spawn on Corellia more than Talus?! Has the beer-guzzler who invents the creature spawns at SOE finally lost his mind/ drank too much and spilled some Draft on the keyboard?! What has this galaxy come to?!?!?! 12:26:00 AM Sheesh. The Lost Village on Talus was full of these things and other panthers. No babies seen so not sure if they spawn or not. Lotsa kitties around tho. 11:43:00 AM I am a lvl 18 or 20 CH (cant remember right off) and i am looking for a baby GSP that i could use at my lvl. If you have one and are on the euro-chim server give me a /tell or email, the name is tocs. 5:01:00 PM Nevermind last post.. One should read the forums before asking stupid question *slaps self* SORRY - Still a GREAT pet though. 3:16:00 PM Could someone clarify. I assume posture down attack isnt crippling strike. I trained my sludge panther, with special attack 1 - And it did the posture down attack. Does it still have crippling strike ? 11:59:00 PM Oh and by the way, back before vehicles, we used to use thier lairs as a shortcut back to town, lol. 11:57:00 PM Back in July 2003, these were highly sought pets. I became very familiar with Talus and could take CH's right to them, lol, without being ranger. Mine does have the posture down attack, and he uses it a lot. I plan to keep my GSP (which is what these are called) for good. As soon as you can get CL25 pets, go to Talus, and use the waypoints listed here. You can't pull missions for them. The adults are not agg, but you may want to make the lair spawn babies, so, it becomes a challenge. It is not unusual to search for them for 3 or 4 days, but using the waypoints here can save you a lot of time. Truly these are the best mid-level CH pets, I have been using mine on Dantooine running Janta Shaman missions, but being master TK, I can help him fight, lol. If you are ranged, and he will be your tank, start small and gradually work your way up 'til you find what the 2 of you can handle. A lot of CH's mastered with these. 12:00:00 PM Ocean, Grand Wrixes have the same Kinetic Protection, which is what every NPC in the game resorts to when an animal is attacking them. So, I would say the 8k HAM is much better then the 6.5k posessed by the G Wrix. This pet is definitely worthy of a level 8. 8:48:00 AM This is no way an 8 for pet worthiness. Grand Wrixes are better. 4:00:00 AM I went out last week to tame some and I found 2 lairs right next to eachother, 4 babies tamed in about 3 hours so they're not very rare. 6:58:00 PM As of today they are lvl25 so no more 3 of them. 10:24:00 PM They also do a posture down attack.